Birds Not Behind Pandemic Flu? What Makes Birds Cooperate Against Predators? As I mentioned in yesterday morning's post, I am in Massachusetts this weekend for the Superbowl of Birding, so blogging will be light. (If you want to know how things are going, check my Twitter account.) This morning I am going to try putting the "DC" back into "A DC Birding Blog" by posting a few birds I saw in the District last weekend. The day after the C&O Canal Count, I wandered around some neighborhoods I liked when I lived there, particularly Dupont Circle and the Capitol grounds. I was not specifically birding, but I did see a few species. Most were common urban birds; my best sighting was a Merlin that zipped past me near the Capitol. While living in the city, I gained an appreciation for some very common birds. House Sparrows, for example, were one of the few species that deigned to visit the windowsill of my apartment. One that I really liked to watch is the Ring-billed Gull. These gulls are more dainty than the Herring Gulls and Great Black-backed Gulls, and the ones in cities are often quite approachable. So last Sunday, when I visited the reflecting pool on the west side of the Capitol, I took advantage of the occasion to photograph a few gulls. First, here is an adult Ring-billed Gull in a hurry. Second, here are two immature Ring-billed Gulls loafing on the edge of the pool. Those were part of a much larger group lined up along the wall. As you can see from the whitewash on the wall, this is a very popular gull location. Eventually they all took off, so I continued around the pool. Today I will be participating in the Superbowl of Birding, an annual competition in Massachusetts to determine who can see the most birds in one day without losing any limbs to frostbite or getting blown into the Atlantic. 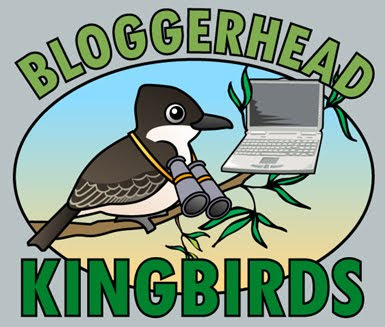 For this year's event, I am part of the Bloggerhead Kingbirds, who participated last year with good results. As you might guess from the name, my teammates are all bloggers: Christopher of Picusblog, our captain; Nate of The Drinking Bird; Corey of 10,000 Birds; Mike of The Feather and the Flower and Andrew the Birding Dude. If you are a birder with a Twitter account, I would encourage you to follow all of those accounts anyway because they all post fun and interesting tweets. I will try to write a post on the competition as soon as I can. In the meantime, I have scheduled a few posts to run this weekend to keep the blog going. Recent surveys show that Idaho's Greater Sage Grouse population is severely declining despite anecdotal evidence to the contrary. It appears that large, flightless birds lost their ability to fly independently of each other about 65 million years ago since moas are more closely related to tinamous than ostriches and emus. Removal of the predation threat from dinosaurs most likely made flight less necessary. A study based on banded Gray Catbirds in New Jersey suggests that catbirds use some sort of olfactory sense to guide migration. The Baltimore Sun profiles a wildlife biologist who works to prevent bird strikes at BWI airport in Maryland. He discusses his techniques, from habitat reduction to harassment and lethal control. A Red-tailed Hawk was badly burned but survived after a small plane crashed near its roost in Illinois. There are photos of the recovering hawk on the rehabilitation center's blog. Climate change is spurring Pied Flycatchers to begin spring migration sooner, but they often do not reach their destinations earlier because of bad weather along the way. Some seabird species change their movements to take advantage of fishery activities. At least two pairs of Bald Eagles are nesting in Middlesex County, NJ. The former Fresh Kills landfill in Staten Island is becoming a birdwatching location, good for raptors and grassland species. A recently discovered fossil dinosaur has many bird-like features and suggests birds diverged earlier than previously thought. Brown Pelicans wintering along the Oregon coast have suffered from cold and hunger. Washington state has a new birding trail. Maps can be viewed or ordered online at Audubon Washington's website. Birds are being cleaned and rehabilitated after an oil spill in Port Arthur, Texas. An Allen's Hummingbird wintering in Cape Cod died after getting sugar water frozen on one of its wings. Great Auk or Greatest Auk: The Lone Pipit, or, Who Was That Brown Bird? A survey of invasive species in 57 countries found a total of 542 invasives, most of them plants. Here is a list of peer-reviewed impacts of global warming. Slower warming in the past ten years may have been caused by a decrease in water vapor in the middle atmosphere. Water vapor, like carbon dioxide, is a greenhouse gas that traps heat near the earth's surface. However, the longer trend is still towards warming because of massive carbon emissions. Middlesex County, NJ, plans to dredge two ponds in Johnson Park and turn one into an environmental study area. Biofuel crop diversity increases the number of beneficial insects attracted to the crops and could improve the amount of fuel it produces. Closing the ozone hole may intensify climate warming. A gene found in both dolphins and bats evolved the same mutations independently to allow the animals to use echolocation. White-nose syndrome is still an ongoing problem among eastern bats. If you are looking for reasons to keep birding this winter despite the cold weather, there are two great citizen science projects starting soon. The number of rusty blackbird counts on E-bird greatly increased, probably largely due to the Blitz and the publicity surrounding the event. During the 7-16 February period, the number of counts increased from 70 to 262 between 2008 and 2009. If you know of any good spots to find Rusty Blackbirds in winter, this would be a good time to visit them and report the sightings through eBird. 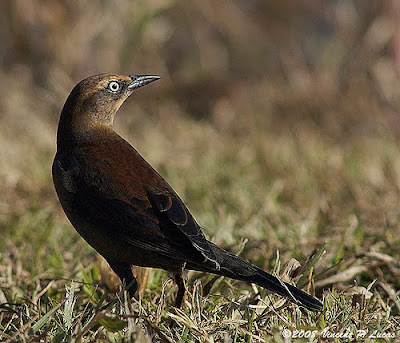 Surveys are likely to be more productive in the southeastern states that form the core of the Rusty Blackbird's range. Second, this winter's Great Backyard Bird Count (GBBC) is coming very soon, February 12-15. The GBBC aims to survey the continent's avifauna in a single weekend by asking birders to count birds in their yards and neighborhoods and report the sightings online. Last year birders submitted over 93,600 checklists. The count is open to birders of every skill level, from the beginners to the most advanced. All sightings are reviewed – first by eBird's sophisticated filters and then by a team of volunteer regional reviewers – so you need not worry about wildly inaccurate sightings corrupting the database. Last year's GBBC documented the largest irruption of Pine Siskins in recent memory. Volunteers recorded 279,469 siskins on 18,528 checklists, which beat the previous high in 2005. White-winged Crossbills also set a record high last year, with 4,824 crossbills on 589 checklists. The GBBC can spark some friendly competition since the website ranks states and localities by species, checklists, and number of birds. My area is not anywhere near the top. However, last year my town finished ninth in species and first in checklists among New Jersey localities. I hope we can keep it there again this year. This Saturday was the C&O Canal Midwinter Bird Survey, an annual event is sponsored by the DC Audubon Society. For the past four years I have helped to coordinate it. Unlike Christmas Bird Counts, which survey likely bird habitat within a 15-mile circle, the canal count is confined to a single national historical park. The count area is thus more linear as it follows the canal along a 184.5-mile strip of towpath and riverbank. Every year we aim for complete coverage, and the effort requires the help of over 100 observers, each working their own short stretch of towpath. Fortunately the survey has the help of many loyal volunteers who cover their sections year after year. To standardize the survey across such a long distance, volunteers keep separate checklists for each mile. As I have done the past two years, I traveled down to DC to participate in the canal count. This time, I went with my friend Jed to help cover a stretch of canal near Little Orleans, an area I visited during previous counts. When we reached the starting point of our territory, we found that the river valley was filled with fog. While we could see and identify birds along the towpath, it was difficult to see much beyond the far side of the canal or any but the most low-flying birds above us. So during our first mile we recorded relatively few birds, with many of the identifications coming by way of vocalizations. Despite the lack of birds, I enjoyed the first section because of the beauty of the canal in the fog. Fortunately, most of the fog burned off after about an hour. It seemed that as the fog lifted, the birds became more active as well. In the next hour we had most of our best sightings. An Eastern Phoebe was foraging actively near the riverbank – one of many that winters along the towpath. Shortly after that, I saw my first Hermit Thrush of the year. One Winter Wren perched near eye level at close range at the same time as another launched into its complex and eerie song. A Red-shouldered Hawk glided over the towpath calling loudly. At the very end of our second mile, we encountered the biggest flock of Eastern Bluebirds I have ever seen. At first I thought it was just a dozen or so, even though bluebird calls were coming from all directions. As we crossed into our third mile, it became apparent that there were dozens more. With the help of another team, we final determined that there were at least 50 bluebirds, and possibly more spread over the two miles. For our last mile, the sky finished clearing, and the sun reflected off the many sycamores that line the canal in that section. We had a chance to watch two Common Ravens – a species I rarely see – playing in the sky together. Once again, a Winter Wren sang. Jed and I saw a total of 27 species on our three miles of the towpath. As of this writing, the sightings reported through the DC Audubon website are up to 81 species. Since about 40 miles have yet to be submitted, the final species tally should be a good bit higher. Some expected species such as American Coot and Great Black-backed Gull are not yet on the list, but most likely will be once the final numbers are available. A new paper based on studies from the Fraser River estuary in British Columbia finds that hunting pressure from Peregrine Falcons (Falco peregrinus) is changing the behavior of Pacific Dunlin (Calidris alpina pacifica). The peregrine population crashed forty years ago, primarily thanks to pesticides, and has since rebounded. All of those new falcons need to eat, and shorebirds are suitable prey because of their size, numbers, and penchant for foraging and loafing in open spaces. Shorebirds have to adopt evasive behaviors to avoid being eaten. One way of avoiding predation is to move to areas without much raptor activity. Some dunlin do this by finding safer roosting locations away from where peregrines are hunting, even if it means flying longer distances to reach them. Others utilize a behavior known as "over-ocean flocking": during high tides, they fly out to sea and remain in flight there for an extended period of time. This behavior was rarely noted by observers prior to the late 1990s, but since then it has been observed regularly. 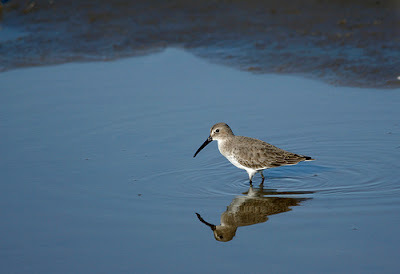 According to daily observations from January 2006, "over-ocean flocking" occurred on 15 out of 17 days, and dunlin spent an average 2.8 hours over the ocean at a time. Most shorebirds build up their body fat reserves to avoid starvation during the winter. 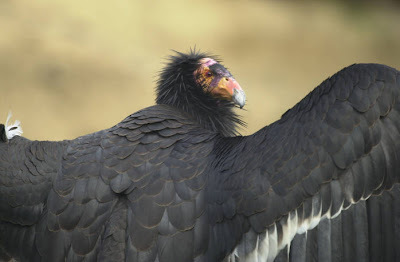 The extra weight helps them survive when food supplies are low, but has the trade-off of making it more difficult to escape predators in flight. In the face of increased predation, shorebirds like dunlin will need to carry less body fat to avoid becoming prey. According to bird banding data, that is exactly what happened when peregrines rebounded. Data from the 1970s shows that dunlin mass builds quickly and remains high through November and December before falling in January and February. By the 1990s, the average autumn peak weight had fallen by about 4 grams, or about 7% of their historical peak body mass. This study is a good example of how conservation actions to benefit one species can have unintended results elsewhere in the ecosystem. In this case, the increased presence of peregrines around coastal areas is forcing dunlin to change their feeding and roosting behaviors. Last summer, the DC Council approved a 5¢ tax on each disposable shopping bag distributed at stores within the District. The goal of the tax was not so much to raise money as to reduce waste and clean up litter. At the beginning of this year, that tax took effect. It is showing results almost immediately. Less than a month into the program, which D.C. officials describe as an effort to reduce litter and generate funds to clean up the Anacostia River, the nickel bag fee is having a big impact. Managers at stores that sell food or beverages say the switchover has cut the use of plastic bags by half or more. One Safeway in Northwest reports a falloff of more than 6,000 bags a week, about half of its former volume. And for customers, the bag law is changing the District's carryout culture in ways large and small. A lunchtime army of office workers now ply the sidewalks with near-naked sandwiches and sodas filling their hands, making some diners more self-conscious about what they buy. Parking lots feature impromptu juggling acts as determined fee-avoiders teeter to their cars with heaping armloads of loose groceries. And people are stockpiling reusable shopping bags -- and routinely forgetting to take them shopping. If the Post is to be believed, many residents are responding to the tax in unnecessarily difficult ways. One resident reports paying more to shop in Virginia so that she will not pay the bag tax. Other residents try to carry more items than they physically can without any bag at all. I hope that these reactions are not the typical ones because adapting to the tax need not involve so much self-inflicted pain. There is a third choice besides a taxed disposable bag and no bag at all – a reusable bag. 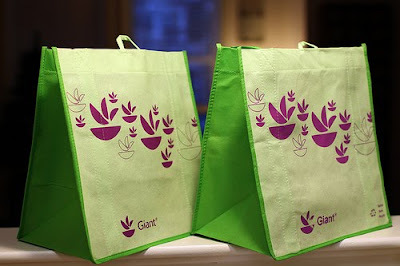 Most stores offer durable reusable bags at cheap prices; one can also pay a bit more to obtain more stylish shopping bags of various sizes and materials. I have read many tips for making reusable bag use easier; one of the best is to keep bags in places that will make it easy to remember them if you go shopping. Still it is good to see that the tax is having its intended effect of cutting back on disposable bags. Over time, I hope that almost all will be eliminated. According to research by Chris Elphick, 95% of female Saltmarsh Sparrows mate with more than one male to produce each clutch of eggs. The average nest had eggs fertilized by 2.5 different fathers. One-third of nests had a different father for every chick. This is a key part of their struggle to produce young that survive and fledge. The saltmarsh sparrow (Ammodramus caudacutus) is a small, stocky bird that lives along the US Atlantic coast. Some of their behaviour is unusual for songbirds; males and females do not bond together to form pairs, and the males play no role in caring for chicks. The sparrows nest amongst the saltmarshes, and are vulnerable to frequent high tides, which can cause a high level of nest loss. Very high tides occur every four weeks - the same length of time it takes for the sparrow to raise a family. Professor Elphick suggests that the mating patterns are are a response to this risky environment. "If they lose their young to flooding, they have to re-nest almost immediately if the new set of young is to survive," he says. This means that female birds do not have time to look for and invest in the best male partner. The lack of time increases the likelihood of choosing a poor quality mate. To overcome this, it seems that females mate with several males. "The females don't want to put all their eggs in one basket so to speak," says Professor Elphick. The Saltmarsh Sparrow has the highest documented rate of extra-pair mating. However, other birds may have higher rates that simply have not been documented yet. The Greater Vasa Parrot (Coracopsis vasa) and the Superb Fairywren (Malurus cyaneus) have comparable rates. Since I am still out of town, I am publishing a second repost. 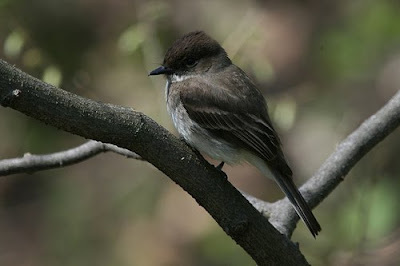 This post on the Eastern Phoebe was the first in my Birds of the Mid-Atlantic Series and was originally published in March of 2006. The only change is the addition of a phoebe photo. I saw an Eastern Phoebe yesterday on the stretch of towpath that my friend and I were covering for the C&O Canal Count. The eastern phoebe is usually one of the last migrants to leave in the fall and one of the first to return in the spring. This species is one of the most widespread and most easily recognized of all eastern flycatchers. Its breeding range covers most of the east coast as far north as Nova Scotia, and west through the Great Plains, as far northwest as the Northwest Territories. Phoebes can be found principally along streambanks and other wet areas, and are easily spotted as they wag their tails and call out fee-bee, fee-bee. 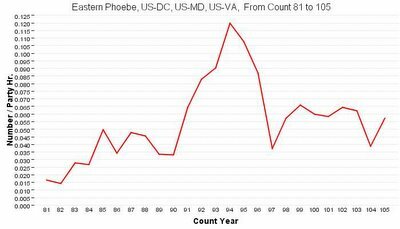 For the last several years I have considered phoebes to be a much better indicator of spring than American robins. This winter, though, has been a different story. I saw my first phoebe of the year on January 5, and have seen this species repeatedly since then. 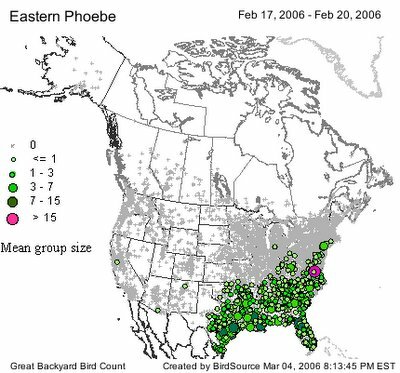 Data resulting from this year's Great Backyard Bird Count show that eastern phoebes have indeed been widespread over the south and mid-Atlantic regions. Some have even been reported as far north as Michigan and New England. Here is a map showing distribution for this winter. Because of a change in the way the GBBC displays its data, it is difficult to compare this to maps from previous years. However, results from the Christmas Bird Count may help. Below is a graph of eastern phoebes found on the Christmas Birds Counts in Maryland, Virginia, and the District of Columbia from the 1980-81 season to the 2004-05 counts. As you can see, there has been a slight increase during the past three decades, from less than .02 per party-hour in 1980-81 to about .06 per party-hour over the past few years. Like several other migratory birds such as the American robin, the eastern phoebe has been expanding its wintering range northward. Other birds have taken advantage of the many feeders provided in backyards. In the case of the phoebe, warmer winters have meant that more insects are available for more months of the year. Phoebes have also adapted themselves to eat berries during the colder periods of winter. The adaptability of phoebes and the ready availability of insects makes long and dangerous migrations unnecessary. Yet, like other early migrants, the appearance of eastern phoebes remains a sign of the coming spring. Any day now I expect to hear the calls of eastern phoebes sounding from wooded patches all over the region. This weekend I am heading to the DC area to participate in this year's C&O Canal Midwinter Bird Survey. The survey, now in its twelfth year, attempts to census the winter bird population of the entire length of the C&O Canal National Historical Park. Since I will be traveling, I have less time for blogging this weekend. So I am presenting instead this post from my Birds of the Mid-Atlantic Series, originally published in April 2006. I picked this post because I just saw a Red-shouldered Hawk in Middlesex County for the first time and because this is a common raptor along the C&O Canal. Recent winter counts have recorded 20-40 of these hawks per year. 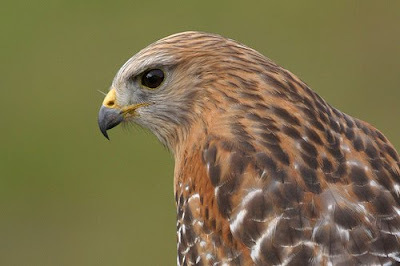 The red-shouldered hawk is a characteristic raptor of eastern woodlands. They get their name from the rufous coloration on the leading edge of their wings, which are otherwise checkered with black and white. The scientific name, Buteo lineatus, refers to the black and white striping on its tail. The harsh, insistently-repeated territorial calls of red-shouldered hawks are easily recognizable. Listen to a sample here. Be careful, though, not to be tricked by a blue jay. Blue jays frequently mimic the calls of red-shouldered and other hawks. In breeding season such mimicry may cause other songbirds to vacate their nests, leaving the eggs open to predation by blue jays. Unlike red-tailed hawks, which seem able to thrive in any habitat, red-shouldered hawks have a strong preference for mature woodland near streams and wetlands. Their diet is heavy in reptiles and amphibians, characteristic wetland animals, though they will also take small mammals. 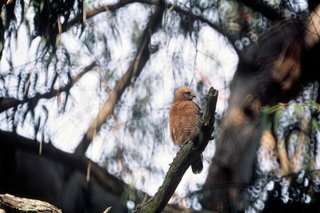 The population of red-shouldered hawks has declined considerably over the past century, due to pesticides and habitat loss. While numbers have improved somewhat since the banning of DDT, the loss and degradation of habitat continues to be a threat. You can see more pictures of this beautiful hawk at the Canadian Peregrine Foundation. There is a good essay asking Who Advocates for Birding? (pdf) in Birding magazine. Marbled Murrelet will keep its protection under the Endangered Species Act despite an effort by the American Forest Resource Council to have it delisted. The species is currently listed as threatened and depends on old-growth forest for breeding. A new study examines factors that influence birds' lifespan. Predictors of a longer life include: large body size, eating plants, social structures, and breeding on islands. Long-living species include flamingos, parrots, petrels and shearwaters. Birds and alligators share a similar lung structure. Los Angeles Superior Court ruled that the city could not support trap-neuter-release programs for feral cats because they violate environmental law. The suit was brought by a coalition of environmental groups who argued that the feral cat colonies have been growing despite TNR and that the city's feral cat population threatens birds and other wildlife. An op-ed writer wonders why California is not protecting its birds, in response to shootings at the Oakland airport and the eviction of Burrowing Owls – a species of special concern – from their burrows to make way for a housing development. It seems that Pink-footed Geese leave quite a large carbon footprint as they scrounge for food in Arctic soil. Thirty-four waterbirds were found shot dead in a Texas park. Bills have been introduced in the House and Senate to ban several species of large constrictor snakes from the United States. The U.S. Dept. of Transportation allocated $810,000 to extend the hiker/biker trail at Sandy Hook from North Beach to Gunnison Beach and Fort Hancock. The article does not elaborate on what route it might take. Wolf sightings have increased in Oregon, suggesting that the species is expanding its range westward. It is possible for offshore wind or wave energy farms to become artificial reefs if they are structured properly. Higher surface temperatures lead to higher methane emissions, a significant feedback effect that could make future warming far worse than current models predict. Global warming may reduce the total number of Atlantic hurricanes each year but make them stronger and increase hurricane damage. The years 2000 through 2009 were the hottest ten years on record according to NASA's statistics. The year 2009 was the second warmest year on record, second only to 1998. I and the Bird #117 is now online at The Marvelous in Nature. In this edition, Seabrooke eschews the more common narrative approach for a hand-drawn pictorial one. 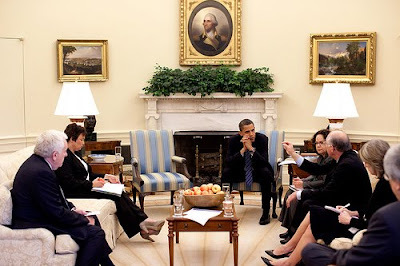 Now that President Obama has been in office for a year, it is possible to get a better sense of his administration's priorities and how much it has accomplished so far. At this point, any evaluation of the administration will be at best incomplete, especially given the absurdly large number of unfilled appointments. The Center for Biological Diversity looks at Obama's record on conservation issues and gives him a C overall. He undid regulations implemented late in the Bush administration to weaken the Endangered Species Act. His Interior Department increased the critical habitat for several endangered or threatened species such as the Canadian lynx and leatherback sea turtle. His administration has protected only two new species , despite a large backlog of candidate species, the fewest since Reagan. He removed protection from gray wolves. He allowed regulations from late in the Bush administration to weaken ESA protection for polar bears. He is continuing policies left over from the Bush administration for managing Snake River salmon. The administration does a lot better on public lands protection than other issues, but even on that its record is not stellar. The CBD report covers endangered species, public lands, oceans, climate, and energy. One could probably find other issues that ought to be part of such an evaluation; for example, I do not see anything specifically on air or water pollution or environmental justice issues. Granted these are probably outside the CBD's mission, but they are part of the administration's environmental record. The major public lands act that Obama signed into law also seems to be omitted even though it may be the most significant achievement so far. During Flicker's tenure, Audubon focused on keeping common birds common, educating the public and decision makers about the important role of birds as indicators of environmental health, and connecting new and diverse audiences to nature and their power to protect it. Flicker envisioned a network of Audubon Centers nationwide to build that connection. Today, 43 Audubon Centers engage more than a million people each year in nature discovery and conservation action. Urban Centers in places such as Los Angeles, Baltimore, Phoenix and New York City are helping to revitalize abused landscapes and empower local communities. Flicker led Audubon through dramatic growth in revenue and programs and as the organization identified more than 2,400 Important Bird Areas across America, working toward their restoration and protection, often in concert with conservation efforts across the hemisphere. He helped educate the public about the alarming decline of bird species through Audubon Citizen Science that fueled headline-making reports and that now forms the foundation of ongoing analyses by an alliance federal agencies and non-profit groups. He championed landscape-level conservation efforts that brought huge strides in conservation of the Everglades and the Long Island Sound. And he brought Audubon's considerable credibility and political clout to the fight against climate change. Frank Gill is the author of a science textbook, Ornithology, and co-author of the International Ornithological Committee's list of recommended English-language bird names. Without knowing the internal dynamics that led to Flicker's resignation and Gill's appointment, it is hard to know whether we should read anything into the move. The replacement of an activist with an ornithologist is interesting, if not necessarily indicative of a shift in emphasis. It is also not clear if the interim appointment will have an advantage over other candidates for the position. In any case, I hope that the next president can find a better answer to the question of Who Advocates for Birding? (pdf) raised in the recent issue of Birding magazine. Someone who knows Audubon much better than I do gives the move a thumbs-up. New research argues that birds are not the source of the 2009 H1N1 outbreak or the 1918 pandemic. Scientists from the Canadian Food Inspection Agency's National Centre for Foreign Animal Disease (NCFAD) in Winnipeg, Canada, together with collaborators in the USA, injected the 2009 and 1918 H1N1 virus strains individually into chickens. None developed flu symptoms or showed any signs of tissue damage up to18 days later, although about half the chickens developed antibodies against the 1918 H1N1 virus showing limited infection. The 1918 H1N1 virus also did not cause disease in ducks. The origin of the 1918 H1N1 virus is unknown and despite its genetic similarity to avian influenzas, the results of this study show it is unlikely to have jumped the species barrier from chickens to humans. The result is that culls and quarantines are unlikely to be helpful for stopping the spread of those two viruses. BirdsEye and eBird have announced the BirdsEye Challenge, with prizes for the birders who submit the most checklists between January 23 and January 31, 2010. The top three eBirders will receive free subscriptions to Birds of North America, Cornell's comprehensive reference guide to birds. The top twenty submitters will each receive a free version of BirdsEye, a bird-finding iPhone app that uses eBird's database to create lists and maps of birds that have been seen recently in your area. 1) Competition is for the total number of effort-based complete checklists from the United States and Canada submitted from 23-31 Jan 2010. 2) Number of species per checklist does not matter, so the eBirders living in the south don't have any real advantage (other than nicer weather, perhaps). 3) A complete checklist is defined as a checklist submitted that answers 'yes' to the question "are you reporting all species to the best of your ability"?. 4) An effort-based checklist is one using any of our four effort-based protocols: Traveling Count, Stationary Count, Random count, or Area Count. 5) Grand Prizes will go to the three people with the highest number of checklists submitted. 6) The BirdsEye prize will be awarded to the 20 registered individuals with the most checklists submitted. 7) Registration deadline is 31 January 2010. Lots of eBird checklists from distinct locations are really helpful to eBird, its visualizations, and its utility for science. The more checklists we get, the better! There is also a registration form if you plan to participate. Also, please note that an iPhone or iPod touch is necessary for using BirdsEye and is not included among the prizes. As I wrote in my original post on BirdsEye, I was one of the app's beta testers throughout the fall. Since then I have done some paid work for them. I have already have a copy of the app, so I will not participate in this particular contest. However I would encourage any birders who have an iPhone or iPod touch to sign up. Both eBird and BirdsEye are already good projects and will get better the more people use them. A recent update to BirdsEye added eBird data from personal locations as well as public hotspots. This should improve coverage in areas without many eBird hotspots (or eBird users) and make the checklists of recent sightings more complete. Sightings from personal locations are displayed on maps with a different icon (just a bird instead of a bird on a stickpin). They are mapped in the general area of a sighting rather than the exact location where a sighting was entered to avoid the problem of sending unwanted visitors onto private property. (In most cases of true rarities, the sighting will be announced on a state listserv or elsewhere on the internet if visitors are welcome.) You can see an example of this in the image at left. Another feature that is new or that I simply had not noticed is that BirdsEye picks up data from Central and South America. This works only for the 847 North American species that are included in the app, so you will not find an Andean Condor or Marvelous Spatuletail this way. But if you want to find out where your favorite neotropical migrants are spending the winter, now there is a way using up-to-date observation data. At right is a map of Black-throated Blue Warbler sightings as of January 18th. As I mentioned in a previous post, I spent much of the past weekend birding in South Jersey. The last place where we stopped was the Glades Wildlife Refuge near Fortescue. The refuge mostly consists of tidal saltmarsh, and much of it is only accessible by boat. The refuge has one patch of very swampy woods along Fortescue Road; a trail winds through these woods out to the marsh, where there is a small observation tower. The woods are very wet, with extensive pools or puddles. Even the trail was under water in many places. On Saturday, the standing water was mostly frozen. Last fall's leaves are now encased in ice with a mix of interesting colors and patterns. The last is probably my favorite of my leaf photos from this trip. You can see the others on my Flickr account. Clicking through the images above will show the photos on black. As I have posted before, about 20,000 gallons of oil lingers in the beaches of Prince William Sound in Alaska. It is left over from the Exxon Valdez disaster in 1989 even though it was predicted to dissipate quickly. Apparently it has persisted due to a very slow rate of biodegradation brought on by the sound's physical conditions. Boufadel said the beaches they studied consisted of two layers: an upper layer that is highly permeable and a lower layer that has very low permeability. He said that, on average, water moved through the upper layer up to 1,000-times faster than the lower layer, and while both layers are made up of essentially the same materials, the lower layer has become more compacted through the movement of the tides over time. These conditions, said Boufadel, have created a sort of sheltering effect on the oil, which often lies just 1-4 inches below the interface of the two layers. He said that because of Alaska's pristine environment, you would expect to find a low concentration of nutrients and this recent study confirmed the earlier findings. What Boufadel and his team found was, on average, that the nutrient concentration in the beaches was 10 times lower than what is required for optimal aerobic biodegradation of oil. They also found that the oxygen levels in the beaches are also insufficient to sustain aerobic biodegradation. The physical conditions described make finishing the clean-up much more difficult. At least now the cause is known, it may be easier to find a solution. Over the past few days, I was visiting some birding sites around Cape May and Cumberland Counties with my parents and sister. This was my first time birding in South Jersey since early November. It felt good to be back at its salt marshes and beaches. On Thursday we stopped at Brigantine, where the highlight was an exceptionally close Bald Eagle at the gull pond tower. The eagle glided in from a long distance away and landed on the ice, at most 100 yards in front of us. This was about as close a view as one can expect to have an eagle aside from one in the hand. Elsewhere in the refuge, the breeding Peregrine Falcons were perched together on their nest platform. Even though much of the water was frozen, the impoundments hosted many of the usual waterfowl. The Black Duck flocks alone were impressive, numbering in the thousands. Adding to their number were smaller flocks of Gadwall, Northern Shovelers, Northern Pintails, Bufflehead, and Hooded Mergansers. There were also a few hundred Dunlin foraging in the shallower parts of the impoundments. Along the way I added two new species to my Atlantic County list: a Wilson's Snipe near the gull pond tower and a Swamp Sparrow along the Leeds Eco-Trail. We stopped at a few birding spots in Cape May on Friday. Our first priority was to see the Eurasian Wigeons that have been hanging around in the state park since the fall. This was not a life bird for me, but it felt like one since this was the best view I have had of this species so far – two colorful breeding-plumaged males, at relatively close range on Lighthouse Pond, in good lighting conditions. (There was also a female on Bunker Pond.) The wigeons associated with a mixed flock of waterbirds, including American Wigeons, Gadwall, a single male Redhead, Ring-necked Ducks, Hooded Mergansers, and American Coots. 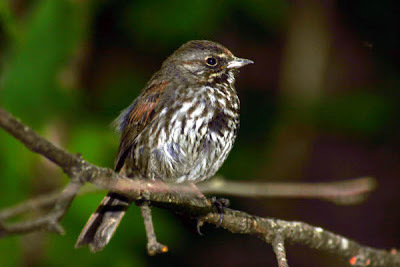 A few Brown Thrashers, a couple Hermit Thrushes, and a Gray Catbird were present along the parks trails, along with dozens of Yellow-rumped Warblers. Along the dunes I saw two Savannah Sparrows and a Horned Lark. One bird that I left unidentified was a very large accipiter that was dashing around the trees near the parking lot. Normally I was count a bird like this as a Cooper's Hawk except.......... that a Goshawk was reported in this park and elsewhere in Cape May within the past few weeks. Given that possibility, I cannot assume it was a Cooper's without a better look. In the afternoon we walked through the Nature Conservancy's Cape May Meadows. I saw an Orange-crowned Warbler halfway up the west path. As with the wigeons, this was not a lifer, but it was the best view I have had of a member of the species. The bird was very yellow (for an Orange-crowned), so it may be an adult male. Other interesting birds from the Meadows included small numbers of Green-winged and Blue-winged Teal, a flock of Snow Geese (a new Cape May County bird for me), and a very noisy Red-shouldered Hawk. Like in the state park, the shrubs at the Meadows were full of Yellow-rumped Warblers. Yesterday we made a tour of birding spots in Cumberland County. East Point Lighthouse, our first stop, had a nice raft of Greater Scaup mixed with a few Lesser Scaup. Many Bufflehead were swimming in the Maurice River. There were also about 40 Dunlin standing on the floating ice – a sight I have never seen before! At Bivalve, we saw an adult Bald Eagle perched at the distant treeline, and three Northern Harriers hunting over the marshes. Most of the water was frozen so waterfowl numbers were very low. The species present included small numbers of Black Duck, Bufflehead, and Hooded Merganser, plus about 125 Snow Geese. The shell piles at the seafood processing plants were less fragrant than normal. At Fortescue, where we ate lunch, there were 20 Dunlin on the beach and 80 Snow Geese flying overhead. Not much else was moving around, either on the bay or on land, at this spot. The best stop was Glades Wildlife Refuge, which we accessed from the Fortescue Road entrance. The woods were fairly quiet, except for a small flock of Cedar Waxwings. The birding improved once we emerged from the woods into the marsh. One subadult Bald Eagle (most likely 3rd winter) was perched near the observation platform, and two adult Bald Eagles were visible at the far treeline near Rt. 553. One Red-tailed Hawk and two Northern Harriers were hunting over in the marsh. As at Bivalve, the water was partially frozen, so waterfowl numbers were lower than I've seen in the past. Species included Black Duck, Bufflehead, Common Merganser, and Hooded Merganser, plus about 80 Snow Geese in flight. I took the phot at the top of this image near the observation platform. It captures the general appearance of the marshes, but not quite the seemingly limitless expanse of marsh grasses that one encounters at sites like the Glades. It is an experience far removed from the suburban and woodland birding that I normally do. 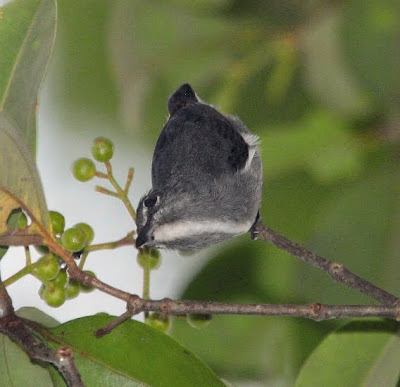 Last month I had the occasion to read and review a guide to the birds of Borneo, so I was interested to hear of a possible new species there, the Spectacled Flowerpecker. I was even more intrigued when I learned how it was found. The bird was found by a birder, Richard Webster, visiting the Borneo Rainforest Lodge in Malaysia's Dayum Valley Conservation Area – apparently a well-known birding location – in June 2009. While birding from a raised canopy-walkway and observation platform near the lodge, he saw several familiar flowerpecker species from the platform and then one that was not familiar, so he took photos of it. This flowerpecker showed prominent clean white arcs above and below the eye, creating a broken eye-ring.... A white throat was bordered by a diffuse dusky malar, which was darker than the cheek, and this merged into solid grey sides that were separated by a white stripe from the throat towards the centre of the underparts. The upperparts were medium-slate grey in coloration, with no additional markings, but there were prominent, pure white pectoral tufts emerging from the carpal joint. The eye, bill and legs were all dark. A day later he returned to the same platform and found a different individual of the same type, except with subtle buffy tones on the underside. The photo at top is of the second bird; photos of the first and second birds can be found at the article. On the following day he returned and found the again. However, David Edwards, one of the co-authors, failed to find the birds on two subsequent visits. Comparison of the photographs with the available scientific literature produced no identification. The authors then compared the photographs all specimens from Dicaeidae, the flowerpecker family, at the Natural History Museum at Tring, the American Museum of Natural History, and the Smithsonian Institution. This still failed to produce a match among any known flowerpecker plumages, including juveniles, so the birds observed appear to be a species new to science. They also considered birds from a few other families, but rejected them because of incompatible features. Given the lack of a type specimen, the authors are unable to confirm it as a new species. 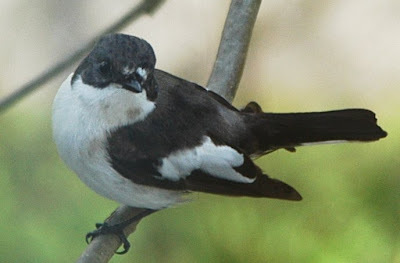 The authors suggest the name "Spectacled Flowerpecker," due to the broken eye-ring, and further suggest that it is in the genus Dicaeum because of the bill structure. The Spectacled Flowerpecker appears to be a canopy specialist, as all observations were at 35 m and extensive ground-level surveys (mist-netting and point-counts) by David Edwards have failed to find it. Despite the lack of a type specimen, the authors are publishing anyway in BirdingASIA in the hope that other birders and ornithologists might help by making further observations or obtaining a specimen. David P. Edwards, Richard E. Webster, and Rose Ann Rowlett. "Spectacled Flowerpecker": a species new to science discovered in Borneo? BirdingASIA 12 (2009): 38-41. David Sibley has a primer on identifying female goldeneyes, inspired by a sighting in New Jersey. Part of the stimulus package is funding a $799,000 habitat restoration at Shawangunk Grasslands NWR in New York. The abandoned runway will be buried with soil and then planted with grasses favored by open-country birds. More than 75% of the Atlantic Puffins from the North Sea's largest breeding colony head to the Atlantic Ocean rather than stay in the North Sea according to new geolocation data. There is a video at the link of a researcher tagging one of the birds. Sleep helps European Starlings remember new sounds to incorporate into their vocal repertoire. Gardeners in California should finish any major pruning now because birds are already beginning to nest. Also in California, a trapping program caught 71 feral peafowl from Palos Verde Peninsula. The birds will be relocated for adoption. A survey in 2008 recorded 89 feral peafowl on the peninsula. Cold weather has driven thousands of Fieldfares from Siberia to a farm in Suffolk in the U.K. There is a video of the flock at the link. A Bald Eagle recently died of lead poisoning in Iowa; nearly 60 percent of the 130 birds that died at rehabilitation sites in the past five years tested positive for lead poisoning. 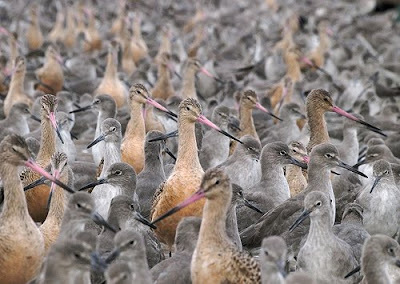 Based on current trends, the Dutch godwit population is aging too rapidly to survive without intervention to improve chick survival. The Globe and Mail answers why Canada Geese walk rather than fly across roads. Finally, here is an article with some fabulous bird photos. The US Fish and Wildlife Service is having difficulty integrating climate science into the agency's decisions. Key questions include how much resources to put into coastal habitat threatened by rising sea levels and what species need protection due to warming. A new report from the Health Effects Institute reviews over 700 studies and finds evidence of a causal connection between car exhaust and childhood asthma, as well as heart disease and respiratory illnesses. A bill passed by New Jersey's legislature would require registration of off-road vehicles and impose higher fines for illegal riding on private or public land without permission. Also in New Jersey, a 73-acre property in Long Beach Township may be transferred from the Army Corps of Engineers to Forsythe NWR. This would protect that stretch of salt marsh from further development. Many new species of herpefauna were recently discovered in Ecuador, including over 30 species of frog and a snake that eats snails. Many bird species are known to cooperate to mob and scold predators such as hawks, owls, or outdoor cats. In North America this behavior is probably most noticeable among jays and crows since they form the loudest mobs. Chickadees and titmice likewise gather to scold a predator when one is found. Other species may participate or use their own cooperative actions to confuse and drive away predators. The general strategy is to gather around a predator and scold while moving around just out of striking distance until the predator becomes frustrated and departs. It is clear that cooperation benefits prey species. Most predators of birds rely to some degree on surprise, and if one or more birds is drawing attention to a predator's presence, that advantage is gone. Predators also need to be also to focus their attacks precisely, something difficult to do while a lot of noisy birds are flying around nearby. However, it is not obvious why birds would evolve such behaviors. If you consider evolution in terms of competition for resources and survival, it may be in the self-interest of some birds to see other birds culled from the population. Mobbing also exposes individual birds to some risk; if one strays too close to a targeted predator, it could easily be injured or killed. So what drives some species to cooperate to fend off predators instead of hunkering down and hiding? One group of researchers decided to test whether the risk of predation influenced birds' willingness to mob predators. To do so they studied the reactions of Pied Flycatchers (Ficedula hypoleuca) to dummy predators near their nests during breeding season. The researchers provided paired nestboxes to attract breeding flycatchers to their study site. Only pairs in which both nestboxes were occupied were used in the study. Once the birds were settled into the nestboxes, researchers trained the birds for five days. Some pairs of nests were presented with a stuffed Tawny Owl (Strix aluco) and playback of Pied Flycatcher alarm calls to condition them to expect a high risk of predation. Other nests received a visit from a stuffed Mistle Thrush (Turdus viscivorus) so that they would expect lower risk. In the experiments, the researchers placed the stuffed Tawny Owl on a platform near each of the nestbox pairs with the owl facing one of the nests. This time there was no audio playback so that the flycatchers would have to find it themselves, and the owl was presented to both the high-risk and low-risk groups. Researchers then watched from a blind to see if birds from the neighboring nest would assist the ones whose nest was threatened. Markings on the trees around the nestboxes allowed the minimum approach distance to be measured from the blind. After 10 minutes of mobbing the stuffed owl was removed, and then an hour later the experiment was repeated with the other nestbox in the pair. As one might expect, the owners of the nest directly under threat had the most intense reaction to the stuffed predator. In fact, the nestbox owners in the high-risk and low-risk groups differed little in their responses. However, we do see a difference in the reactions of flycatchers from the neighboring nestboxes. Among the high-risk group, neighbors always came to the assistance of the nestbox pairs, versus 61.5% of the time in the low-risk group. 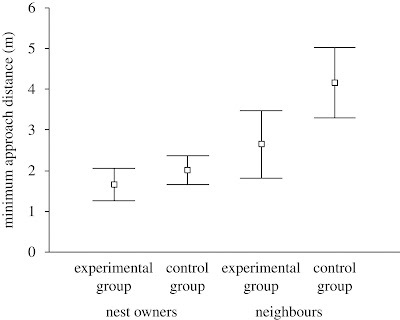 Neighboring birds from the high-risk group also mobbed more intensely than neighbors from the low-risk group, although in both cases the neighbors reacted less intensely than the nestbox owners. When the tests were repeated an hour later, the results were similar. For Pied Flycatchers, at least, the increased risk of predation encourages neighboring nesting pairs to cooperate to remove one threat to their success. This may happen through learned reciprocity. Alarm by one nest owner might attract the attention of other nesters, and their reactions might encourage the first nest owner to come to their assistance in turn. The authors further suggest that other types of cooperative behavior might have a similar origin in risky environments. Last week, Jeffrey Wells of the Boreal Songbird Initiative published an interesting evaluation of state endangered species lists in PLoS ONE. (I wrote about the article here.) Looking primarily at birds, Wells and his co-authors found that states were effective at protecting species that were globally at-risk and for which they bear high responsibility. However, they also protect many species whose overall populations are secure but happen to be rare in a given state. In other words, resources might be wasted on stable populations when they could be better used on more vulnerable ones. The Philadelphia Inquirer this week has a closer look how state wildlife agencies in this area handle their endangered and threatened species lists. Like the situation nationally, the local lists have uneven coverage: Pennsylvania lists Great Egret and Blackpoll Warbler, but not Cerulean Warbler; New Jersey lists Savannah Sparrow but not the more vulnerable Saltmarsh Sparrow. State officials argue that their mission is local rather than global biodiversity. Pennsylvania officials had a lot more to say than New Jersey officials, so I will quote them below. "We have this mandate to maintain the health of Pennsylvania's environment, not the world," says Dan Brauning, wildlife diversity chief with the Pennsylvania Game Commission, which has oversight for bird conservation. Even if losing a niche species here wouldn't really destabilize a nationally abundant population, "Pennsylvania is a much better place with them than without them," says Brian J. Byrnes, Important Bird Area Coordinator for Audubon Pennsylvania. They also argued that the state has programs that go beyond the species on their endangered species list. In order to qualify for a new source of federal funds, states have had to devise "wildlife action plans" for conservation. "The mantra," Brauning says, is "to keep the species from becoming endangered." 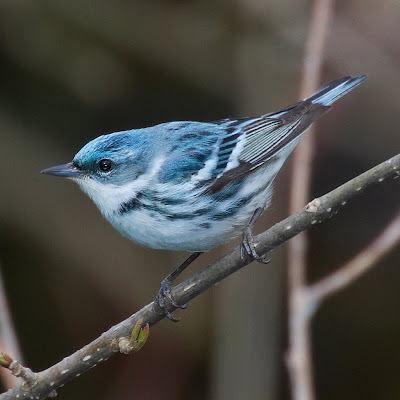 These plans, too, have lists; in both Pensylvania and New Jersey, the cerulean warbler is included. Brauning says Pennsylvania dedicates about $300,000 annually toward nongame bird conservation. But federal funding for the state's wildlife action plan has averaged $1 million. That has allowed the state to actually spend more on the cerulean than it has on the sedge wren, which is listed in the state but is common nationally. Innovative cerulean research is under way in the Allegheny National Forest, Brauning says, adding that in some cases, listing a bird might actually hamper research efforts. As each individual bird becomes more valuable, it's harder to rationalize, say, capturing a few to extract blood and feather samples to get health data. The risk of their dying is too great. The State Wildlife Action Plans, by the way, is a good program and an important source of funding for local conservation efforts. (Each state has one, and all are posted at the link.) However, I am not sure that this federal funding program is really a replacement for state endangered species lists. Endangered species lists do play a role in funding priorities, but they are just as much about creating a legal framework for protecting species and their habitats from direct harm. It is great that the federal government is funding innovative Cerulan Warbler research through Pennsylvania's wildlife action plan – and I mean that seriously – but what will the state do when someone wants to clearcut a forest on private land that provides important Cerulean Warbler habitat? What will New Jersey do when more coastal developments impinge on Saltmarsh Sparrow habitat? Similar questions could be raised about numerous other species. To some extent these issues can be addressed through strategic land purchases, but states can only buy so much land, even with help from the federal government and private donors. As I wrote in my previous post on this subject, protecting globally at-risk species, such as the 192 Critically Endangered birds, is primarily the job of the federal government rather than state governments. The federal government is better positioned to implement conservation measures across state borders and cooperate with neighboring countries. If funding is a constraint to listing and protecting more at-risk species, then the relevant budgets ought to be raised; as it now stands, wildlife conservation is a minuscule portion of the overall federal budget. Meanwhile states need to pick up some of the slack left by the federal government and re-evaluate whether their own species lists represent the best use of state resources. I have posted before about some of the incredible migration flights undertaken by birds, such as the nonstop flights of Bar-tailed Godwits across the Pacific or the circumoceanic wanderings of Sooty Shearwaters. Red Knots travel each year from Patagonia to the Arctic and back, as do some other shorebird species. Another bird species that undertakes impressive migration flights is the Arctic Tern (Sterna paradisaea). Every year, Arctic Terns make a 43,000-mile round trip between their wintering grounds in Antarctica and their breeding grounds in the Arctic. The terns' routes were finally mapped through a banding study that outfitted each of the banded terns with tiny geolocators to track the birds' geographical locations along the way. The first surprise is that the terns do not make straight for the Antarctic when they leave the Arctic, but make a lengthy stop-over in the middle of the North Atlantic, about 1,000km (620 miles) north of the Azores. Here, they feed on zooplankton and fish to fuel themselves for the long journey ahead. The birds then head south along the coast of western Europe and western Africa before making a choice, either to continue hugging Africa or sweep across the Atlantic from the Cape Verde Islands to continue the journey along the Brazilian coast. About half the birds that were tracked decided to take the South American path. It is not clear why, but the researchers believe wind might make either route seem favourable to the terns. 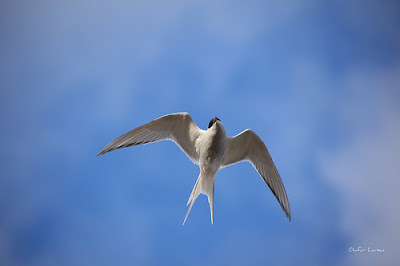 After spending their northern winter months in Antarctic waters, the terns then fly back towards the Arctic. But rather than retracing their southward flight paths, the birds follow a gigantic "S" pattern up the middle of the Atlantic Ocean. Interpolated geolocation tracks of 11 Arctic terns tracked from breeding colonies in Greenland (n = 10 birds) and Iceland (n = 1 bird). Green = autumn (postbreeding) migration (August–November), red = winter range (December–March), and yellow = spring (return) migration (April–May). Dotted lines link locations during the equinoxes. Credit: Greenland Institute of Natural Resources. The spring route carries the terns northward along the west coast of Africa and then along the east coast of North America. (See the maps included in the BBC article.) This may mean traveling a longer distance than a more direct route would be, but the article's authors explain the different migration routes in fall and spring based on prevailing winds. It may be more energy efficient for the birds to move clockwise in the North Atlantic a counter-clockwise in the South Atlantic since they can benefit from a tailwind both ways. 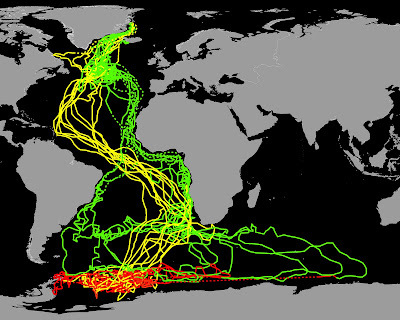 It is worth noting that ocean currents follow a similar pattern and could potentially influence the ease of finding food along the way. Whatever the reason for their routes, these terns give us an additional reason to marvel at the natural world and its avian inhabitants. The U.N. has declared 2010 an International Year of Biodiversity in the hope that greater awareness might stem the ongoing extinction crisis. Many conservationists consider the current crisis to be the earth's sixth mass extinction. The U.N.'s current effort follows in the wake of unsuccessful efforts to reduce biodiversity loss. The UN Convention on Biological Diversity (CBD) was agreed at the Rio Earth Summit of 1992, alongside the climate change convention. But it acquired its key global pledge during the Johannesburg summit of 2002, when governments agreed to achieve a "significant reduction" in the rate of biological diversity by 2010. Conservation organisations acknowledge that despite some regional successes, the target is not going to be met; some analyses suggest that nature loss is accelerating rather than decelerating. Stemming the tide of extinctions is important in its own right, but it takes on added significance since properly functioning ecosystems provide services that are expensive to replicate. A large on-going UN-sponsored study into the economics of biodiversity suggests that deforestation alone costs the global economy $2-5 trillion each year. In his speech at Monday's event, United Nations Environment Programme (UNEP) executive director Achim Steiner is due to highlight problems caused by invasive species, and the potential for ecosystems such as forests and wetlands to absorb and store carbon from the air. The UN hopes some kind of legally-binding treaty to curb biodiversity loss can be agreed at the CBD summit, held in Japan in October. One element is due to be a long-awaited protocol under which the genetic resources of financially-poor but biodiversity-rich nations can be exploited in a way that brings benefits to all. However, given the lack of appetite for legally-binding environmental agreements that key countries displayed at last month's climate summit in Copenhagen, it is unclear just what kind of deal might materialise on biodiversity. After the dispiriting turn of events at Copenhagen, I do not have high hopes for what the coming biodiversity summit will produce. However, any improvement over the current state of affairs would be welcome, particularly if negotiators can find a fair way to reduce tropical deforestation. To see which species are in danger of extinction, see the IUCN Red List, which is the most comprehensive catalogue of threatened species. Among the world's birds, 192 are considered Critically Endangered, an IUCN category indicating that a species has undergone rapid loss in its population and has a high likelihood of becoming extinct without immediate action. TIME also has a list of highly endangered creatures, but that list is more skewed towards large, charismatic mammals. The Endangered Species Print Project has an artistic way of looking at biodiversity loss.